1 of 3 Heat oven to 350 degrees F. Coat a 1-1/2-quart casserole dish with nonstick cooking spray. 2 of 3 Mix cream of mushroom soup, milk, soy sauce, and a pinch black pepper. 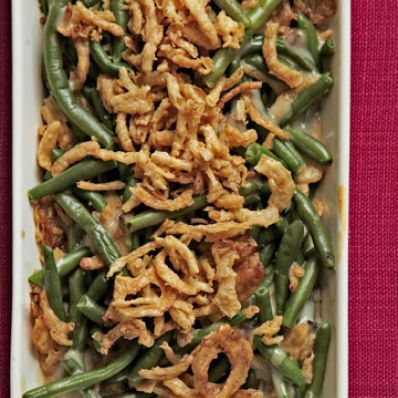 Stir in green beans, and 1 can French-fried onions. Bake at 350 degrees F for 20 minutes. Stir well. Top with other can of French-fried onions. Bake for 10 minutes. Per Serving: 2 g pro., 256 kcal cal., 648 mg sodium, 3 g fiber, 5 g sat. fat, 4 mg chol., 17 g Fat, total, 21 g carb.